Provides an interdisciplinary forum where rehabilitation researchers and clinical providers from around the world come together to learn, share and collaborate. Fosters translation of the latest rehabilitation research into effective clinical technology and treatment paradigms. Advocates for legislation and public policy that support the healthcare needs of individuals living with disabilities. Initiates dialogue with payers and regulators to communicate the collaborative care models that produce positive rehabilitation outcomes. Help advance the ACRM mission to IMPROVE LIVES. DONATE ONLINE through the secure member login portal. If this is your first visit to the site, please complete a New Visitor Form. Once you are logged in, click “Donate Now,” select your fund of choice, and complete the required fields. Be sure to click “Donate Now” to complete your transaction. *Non-members can also donate electronically by clicking this link and completing a New Visitor Registration Form to get started. Did you know you can make a donation to ACRM at no cost to you? ACRM is now registered with the Amazon Smile Program. Here’s how it works. Go to Smile.Amazon.com for all your online shopping. You’ll have access to the same merchandise at the same prices found on Amazon.com. 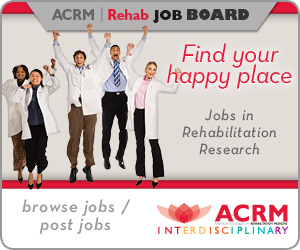 Search for “American Congress of Rehabilitation Medicine” and select ACRM as your organization. Every time you shop at Smile.Amazon.com, ACRM will automatically receive a donation of 0.5 percent of your total purchase. 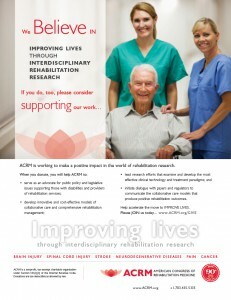 Thank you for considering ACRM. Should you have any questions or need assistance, please contact Sarah Barrah, Member Services Manager, +1.703.435.5335. ACRM is a nonprofit, tax-exempt charitable organization under Section 501(c)(3) of the Internal Revenue Code. Donations are tax-deductible as allowed by law.